MONTEREY, Calif. – TruSpeed Autosport driver Kevin Woods took his ninth victory of the season in an exciting Race 11 of the Pirelli Trophy West USA series at WeatherTech Raceway Laguna Seca. 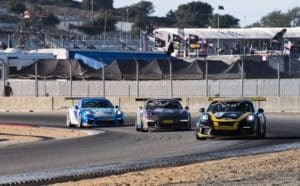 The series, which has staged primarily stand-alone race weekends this season, joined the premier American sports car series, the IMSA WeatherTech SportsCar Championship, for the Monterey weekend. 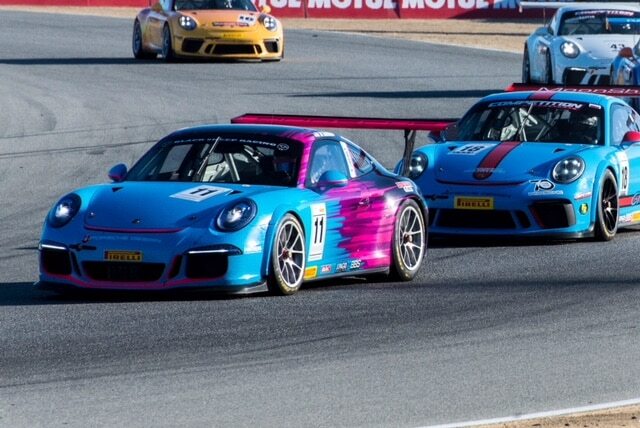 The race combined the GT3 Class (featuring the Diamond Class for 2017-18 second-generation Porsche 991 GT3 Cup machines, the Platinum Class for 2014-2016 Porsche 991 GT3 Cup cars, and the Gold Class for 2010-2013 997.2 GT3 Cup Cars) and the GT4 Class (for the Silver Class Porsche Cayman ClubSport GT4 MR and Bronze Class Cayman GT4 Cup Trophy). 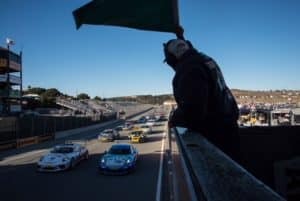 The racers enjoyed a 23-lap, 35-minute flag-to-flag race in the cool afternoon sunshine at the legendary Monterey road course. As the green flag fell, Kevin Woods put his No. 94 Mothers/TruSpeed Autosport into the lead on Lap 1 when pole sitter Loren Beggs ran wide in Turn 6. 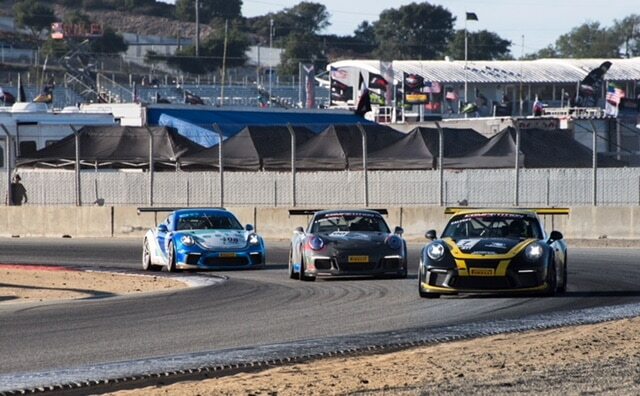 Beggs came back on track in eighth and began working his way back through the GT3 field. By Lap 11, Woods held a six-second lead over Competition Motorsports’ Preston Calvert, with Platinum Class leader Sean McAlister in third. The 21-year-old McAlister made the pass on Calvert in Turn 4 on Lap 12 as the pair encountered traffic to take second position overall, with Beggs making the move into third on the next lap. Woods, from Newark, California, was uncontested the rest of the way to take his ninth victory of the season in the Diamond Class, with Beggs and Mike Thurlow second and third in class. Calvert held on for third overall and the Diamond Masters class victory over Michael Zuieback and Will Tait, while McAlister took the Platinum Class victory over Mark Davidian and Dave Elsner. 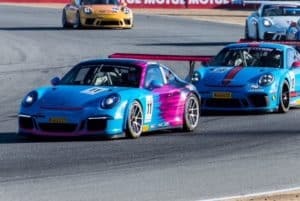 TruSpeed Autosports’ Will Lin made the move around Ross Jaffe on Lap 6 to take the Gold Class lead, with the top three runners in the class– Lin, Ross Jaffe and Ranson Webster – running nose to tail for much of the early going. But a mechanical issue sent Lin to the pit lane on Lap 17, handing the class lead to Webster in the No. 12 Chargerback Porsche, with Jaffe second. In the GT4 classes, Bronze Class championship leader Laura Ely (No. 09 Black Sheep Racing) had a great jump at the green flag, but Silver Class leader and GT4 pole sitter Chris Bellomo (No. 67 The Racer’s Group) held off Ely as the pair went side-by-side through Turn 2. Ely was able to stay on the rear spoiler of Bellomo but could not get close enough to make a move. Ely and Bellomo, both Northern California natives, took their respective class victories. The race was even more special for Bellomo, with his family and TRG team owner (and the owner of Sonoma-based Adobe Road Winery) Kevin Buckler there to cheer him on. The Pirelli Trophy West USA will return to WeatherTech Raceway Laguna Seca for Race 2 on Sunday with the green flag set to fly at 10:20 a.m. PDT. 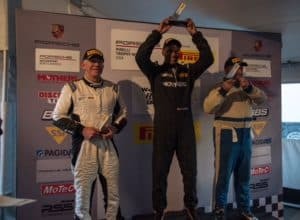 Live timing and scoring can be followed at http://www.competentmotorsport.com/index.php/live-timing/.